In response to a freedom of information request I filed with the FBI in June of 2014, the agency has finally released 44 heavily redacted pages. Why would the FBI have a file on Bucky Fuller? Well, for one thing, he was a counterculture icon with unconventional ideas about resource allocation, environmental conservation, and globalization. And as we know, the FBI has historically been rather uncomfortable with counterculture icons. But there are other reasons that the FBI wanted to keep tabs on Fuller. Most importantly, Fuller was not afraid to take a paycheck from the US government for work on sensitive projects. In fact, he designed buildings for US propaganda exhibits in the Soviet Union during the Cold War and the domes that comprised the DEW Line, the radar system stretching across Canada, built to detect missiles fired from the Soviet Union. Looking over the file, it appears that the FBI was most concerned with whether Fuller had ever been contacted by Soviet agents during his trips to the USSR in the 1950s and 60s. Below, we have a brief rundown of the file, along with the 44 pages released by the FBI. 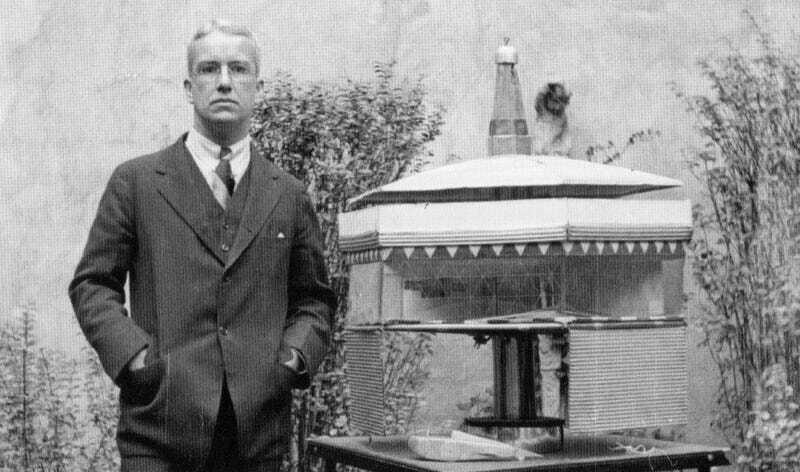 R. Buckminster Fuller (his first name was Richard, but he went by Buckminster or Bucky) was on the FBI’s radar at least as early as the mid 1940s. Bucky was on a list as a member of the American Soviet Science Society, though this wasn’t terribly concerning to the FBI. The Society was formed during the second World War and had a mission of cultural exchange at a time when the US and Soviet Union were allies. The organization was dissolved in 1948. By 1959 the FBI’s interest in Fuller and his travels appeared more substantial. Which makes sense, given Fuller’s involvement with the American National Exhibition in Moscow during that summer. Fuller designed the geodesic dome that was the most prominent symbol you saw as you approached the exhibition. Unfortunately, due to the redactions, it’s unclear what they were so interested in specifically during that year. Some of Bucky Fuller’s most iconic work, including the Dymaxion Houses, the Dymaxion cars, and even his geodesic domes, predated the 1960s. But it was the 60s when Fuller would truly become a public figure. So it seems only natural that if the FBI had any interest in the man before, they especially wanted to know what he was up to during that tumultuous decade. In 1960 the Washington Field Office (WFO) was looking into Fuller and his activities from the previous year. But again, the redactions make it hard to decipher what the FBI was investigating when it came to Fuller. In a February 1960 memo, the FBI discussed a payment made to Fuller. It’s unclear who made the payment or how much it was for, but the FBI explained that it could have been made for legitimate (presumably, non-spy related) purposes. By 1964, the FBI had again taken a special interest in Fuller’s travels to the Soviet Union and potential meetings with Soviet individuals in the United States. The file repeatedly references redacted sources of information on Fuller and his whereabouts. The documents and memos from 1965 are full of heavily redacted confidential sources, seemingly from Southern Illinois University, where Fuller was a professor. The redactions become pretty damn thick in 1965, but everything hints at concerns over Fuller’s contact with the Soviets. Below is a memo to the director of the FBI from May 27, 1965. It notes that Fuller had been in contact with an employee of the KGB, and that FBI agents should set up an interview. The FBI had decided to interview Fuller, but wanted to protect their sources as best they could. They were interested in his relationship with one individual in particular, but were going to pay him a visit under the pretext of a debrief concerning his recent trip to the Soviet Union. Fuller was an extensive traveler, and the file notes repeatedly that it would be hard to nail down where he might be any given week. When the FBI reached out for an interview with him in August of 1965 he was vacationing in Maine. The interview was finally conducted on September 15, 1965 after he returned to his home in Carbondale, Illinois. The key figures that the FBI wanted to know about are redacted, but they seem to revolve around a 1963 lunch in Denver, the 1963 World Affairs Conference, and the 1964 Dartmouth Conference in Leningrad. Whoever the FBI was interested in, it appears to be someone of Russian heritage who lived in or simply frequently visited the United States. Fuller’s contact with this person was simply “playing politics” to get their assistance in promoting his “World Design Science Decade 1965-1975” plan in front of the United Nations. The plan was a sprawling and ambitious framework for solving the world’s problems through good design and efficient use of the world’s resources. If you’ve ever seen or heard a Fuller lecture, you know he liked to talk. A lot. Words seemed to pour out of him, sometimes in an almost obnoxious torrent. You get a sense just from reading the report of the FBI’s interview with Fuller that he gave them an earful. As the file explains, Fuller appeared to be completely cooperative and promised that if he was ever approached by anyone from the Soviet Union again, he would immediately let the FBI know. And that’s it. The file dries up in 1968. He would continue designing, teaching, and rubbing elbows with famous people who adored him until his death in 1983. He was even awarded the Presidential Medal of Freedom, the highest civilian award given in the US, by President Reagan shortly before Fuller’s death. Where’s the rest of the file? Despite releasing 44 pages of the file, the FBI reports that the entire thing is actually 69 pages. The yet unreleased pages either originated in or involved other government agencies, so the FBI says that they need to contact those agencies for permission to release any of those pages. So who are these agencies? They could be as potentially scandalous as the CIA or NSA. Or it could just be the Department of Agriculture. We don’t know. But given both Fuller’s quasi-radical politics, as well as his frequent trips to the Soviet Union, I’m guessing they’re not crop reports. The 44 pages we have appear embedded below. If we ever get the rest of the file, we’ll certainly let you know.